Cape Town, 14 November 2016: Twelve-year-old Duncan was diagnosed with Type 1 diabetes at the tender age of three. 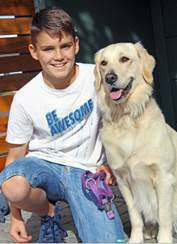 He is currently in Grade six, lives in Cape Town with his family and, like many other teenagers, Duncan’s best friend is his dog, Honey. But Honey is no ordinary dog. She could one day save his life. Honey is in the process of being certified as the first official Medical Alert Dog to be trained in South Africa, specifically, to assist Duncan in managing his complex health condition. Some of the ways the dog does this is by identifying the scent changes that are associated with life-threatening medical events such as low blood sugar levels which have been a real struggle for his parents to date. To date, Honey has already woken Duncan up once due to a drop in his sugar levels and, with more training, her ability to detect the smell of a hypoglycaemic episode, will become stronger and more reliable. “We first tried to get a Medical Alert Dog for our son from overseas but realised it would cost in excess of R100k, so we looked into local trainers and sought a sponsorship to train our dog. With the help of funding from Sanlam we could invest in Honey’s training. It was the start of a new journey for Duncan and our family,” says Greg Smuts, Duncan’s father. According to the international Diabetes Federation (IDF), there were 2.28 million cases of diabetes in South Africa in 2015 alone, but for every diagnosed adult, there is one undiagnosed adult and the number of undiagnosed cases is estimated at around 1.39 million individuals. Unfortunately, undiagnosed people face a higher risk of developing harmful and costly complications. South Africa currently spends an average of US$918.9 (R 12 420) on healthcare costs for each person living with diabetes and is one of many middle and low-income countries with higher diabetes prevalence in people under 60 compared to the world average. “There is a growing burden on the economy to manage diabetes, and we need innovative methods aimed at controlling the disease and raising awareness. Medical alert dogs will raise public awareness, and offer diabetics medical and emotional support, as well as greater freedom of movement, because the dog becomes an extension of the individual,” says Dr Morkel, a Sanlam Medical Advisor. She adds that simple things like school outings, sports participation, attending birthday parties or sleepovers with friends are often a challenge for diabetic children who require regular insulin injections or whose blood glucose needs to be checked every few hours. She says it is likely that such children will experience a medic alert dog as a companion rather than another guardian attempting to control their lifestyle or social activities. “Honey was our family’s very first dog. Since then, and from watching how well our children have taken to her, we have bought another dog for our youngest son. We do however face many challenges as this concept is still quite new in South Africa, but we are hoping that through Honey’s example, we will encourage other families to consider this additional assistance,” says Jennyanne Smuts, Duncan’s mother. Individuals who need continuous monitoring can secure risk cover if their diabetes is optimally under control. Where this is not the case, an insurer may decide to defer issuing cover while providing the doctor who treats the person with guidelines detailing the desired level of disease control required in order to provide cover to that person. 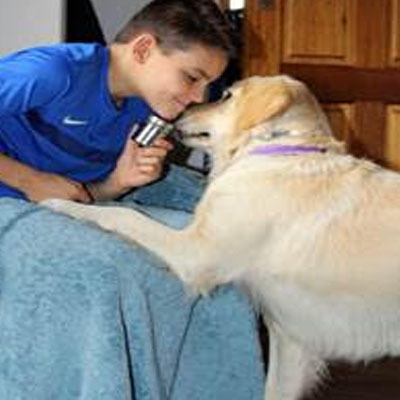 Although the dogs assist, they are neither a guarantee nor a permanent solution to the problem – effort and time to manage the child’s diabetes is still needed from the family. 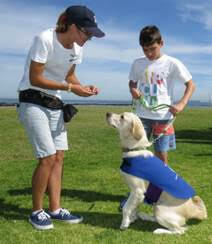 For more information on medical assist dogs and Duncan’s story visit www.justdogsbehaviour.co.za and www.medicalalertdogs.co.za.